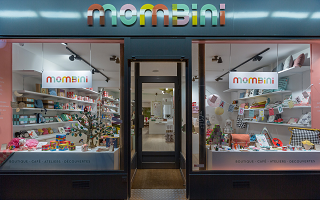 The name of this store and café is a promise: mombini it’s moms + bambini (mothers + children) in Italian and in English. And once there, this promise is 100% kept: at the entrance, a “fresh and colourful store, with cute baby gifts, elegant home decor, smart games and lots of playful accessories for the younger ones.” (it is so true, I just have to copy-paste their description 😉 ). 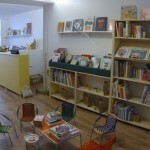 Going further inside, a café welcomes families with children: homemade cakes, cafe, tea, organic juices, and a play area where children can exercice while parents take a break. And of course, the place is equipped with all the necessary baby gear: highchair, bouncer, changing facilities, kid toilets, …. mombini also organizes workshops for moms, dads and children. Whether you need to find a gift, want a new decoration set for your child room or just take a break in family-friendly place, enter mombini ! In the 17th district you have a beautiful and huge parc where your children can play, run, take a rest… And if after your ride, you discrover a beautiful toy shop to take home a souvenir from France? 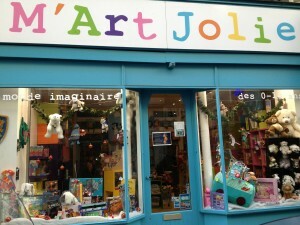 M’art Jolie is opened since 1999, you can find a lot of type toys like security blankets, smart toys, board games, puzzles… You will find necessarily what you want. 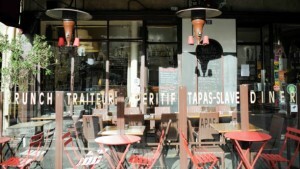 And if after a strole of Pigalle or visiting the Sacré Coeur, you test the Hungarian cuisine with your family? Discover the Paprika restaurant which purpose from the original East , refined and homemade food in a cozy atmosphere and retro spirit ! And during the beautiful days enjoy their terrace. For your baby, a highchair and a bench to change he/she in the toilet at your service. For you and you baby you can listen to a French story, it’s can be a unique experience for you and your child to discover the French language.